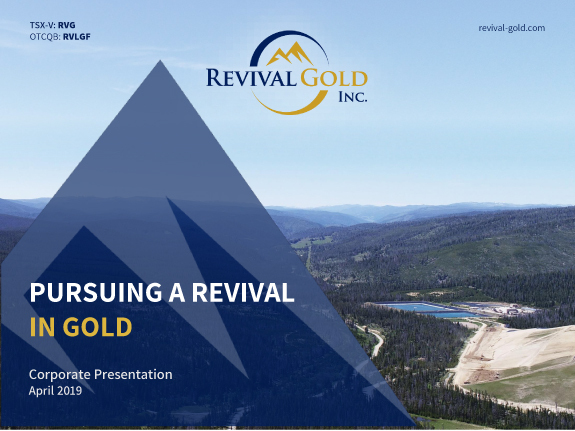 Revival Gold to attend Investor Conferences - Revival Gold Inc. Precious Metals London Summit 2018 to be held in London, England on November 8, 2018 at The Hyatt Regency – The Churchill. The corporate presentation will be held November 8, 2018 at 4:15pm. Interested parties that wish to schedule a meeting, or who would like more information regarding the conferences and events noted above, please contact Andrea Totino, Investor Relations Manager at 647-953-5962, or email atotino@revival-gold.com. Corporate presentation and fact sheet information materials are available on the Company’s website at www.revival-gold.com.